To clarify, it wasn’t exactly Don Diego de Vargas who was banished from the Fiestas. It was the “Entrada,” the ceremonial re-enactment of his entry into the city in 1692. The Entrada has become known as a celebration of Spain’s “peaceful reconquest” of the Pueblo Indians of New Mexico, but this is actually kind of revisionist history. It has long been offensive to Pueblo Indians and has finally been terminated through the efforts of activists. First enacted in 1712, this ceremony became a salient feature of the Fiesta de Santa Fe, a week-long series of colorful activities that comes to an end this Sunday. The effort to get a handle on the issue regarding this celebration requires going way back in history, actually to 1598 when the Spanish conquistadors first came to New Mexico. I wrote about this in an earlier post, so I will leapfrog to 1680. 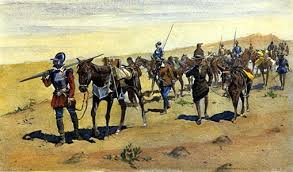 This was the year when the consequences of the invasion of the conquistadors and the Catholic Church resulted in the Pueblo Revolt, which drove Spanish soldiers, settlers, and priests south to El Paso. 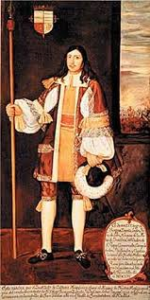 Now we leap to 1692 when Don Diego de Vargas, the governor of Mexico, headed north with 200 men to try to recapture Santa Fe where the Spanish had established a settlement in 1607. Many of the Pueblo Indians along the way had evacuated on receiving word of the armed approach. De Vargas first negotiated with the 2,000 residents of the settlement, but they didn’t yield until he threatened an attack. To celebrate, De Vargas arranged a religious ceremony involving priests who had come with him and some former residents. The next day, mass was celebrated and Pueblo children born during the period of Spanish exile were baptized. Before returning to El Paso, De Vargas performed the same ceremony at 12 other pueblos. Unfortunately, peace did not last, and the next year De Vargas had to return with soldiers and settlers and recapture the city, killing some 70 Pueblo men. The women and children were turned over to the settlers as servants. There goes the idea of peaceful reconquest. And this was only the first of many bloody battles with the Pueblo Indians that finally came to an end in 1696. A vivid image comes to mind that illustrates the difference between the truth of things and what celebrants have wanted to believe. When the Entrada passed by the portal of the Palace of the Governors in later years, it was adorned by colorful Spanish shields. During the years of conflict, however, there had been an occasion when it was hung with the ears of rebelling Pueblo Indians. In the history of Santa Fe, the abandonment of the Entrada brings up a larger question. Are Americans here and there becoming more interested in the truth of things than what we have been led to believe, what we would like to believe? And what a great place for the issue to surface, because Santa Fe is itself something of a “construct,” as the saying goes. Now we jump to the year 1912, which was an important landmark in the city’s history. First of all, it was the year when New Mexico became our 47th state. It was also the year when the city came to terms with the fact that its greatest potential resided in becoming a major tourist attraction. The beauty of the landscape, the dry climate, and the cultural richness of the area had always had great appeal. Artists and writers were drawn to it as were people from all over the country trying to recover from tuberculosis, but it had trouble attracting businesses. When railroads began to transport visitors and products like building materials throughout the West in the 1870s, it had been hoped that Santa Fe would become an important whistle stop for one of them and commerce would burgeon. Unfortunately, that did not happen. For one thing, the terrain was not optimum for railway lines, so Santa Fe finally had to negotiate a spur. A stop was established about a mile from the plaza, the heart of Santa Fe, but new businesses were not attracted to the city. By 1890, it was losing population and clearly in decline. Something had to be done. Thus, civic leaders were finally able to make a strong enough case for tourism to gain support for a plan to create a “Santa Fe Style.” It would govern further development while activities were developed to attract more tourists. There were issues to resolve, though, like irritations among all the different people–americano, anglo-americano, nuevomexicano, hispano, and nativo. They eventually became complicit with publicity to the effect that the city is an example of successful triculturalism, meaning Hispanics, Native Americans, and Anglos living in harmony. Of course, this is not entirely true. The civic leaders also committed to a “look” for Santa Fe that is extraordinarily homogeneous. We know it as Pueblo Revival Style, and it is very evocative of the ancient Pueblos, construction in consistent earth tones and flat roofs that blend attractively with the landscape. 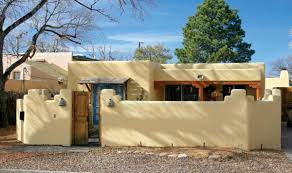 Although the architecture is evocative of the ancient Pueblos, Chris Wilson, author of The Myth of Santa Fe, explains that the style is of more complex origin. Spaniards brought with them their own flat roof designs and didn’t copy the terraced, multistory forms of the Pueblos. The latter were characteristically constructed from rocks and mortar, whereas the Spanish had developed the adobe brick. There are many details in Wilson’s book about the architectural influence of Spain, which I won’t go into here. 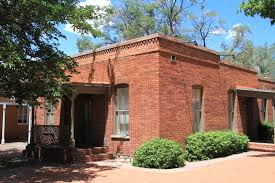 However, in about 1930, the look of Santa Fe expanded to embrace Territorial Revival Style, which was influenced by the national popularity of Greek Revival Style. It is most easily identified today by brick borders around the tops of buildings. It is interesting living in a city so profitably grounded in the past. The mind goes back to that moment in history when the Spaniards invaded this region, disrupting a way of life among the Pueblo Indians that had developed over a thousand years. It was a calamity for them, but looking at it from a larger perspective, what is the truth of things? To what enduring degree was it bad for the Pueblo Indians? To what degree was it of benefit? The Spaniards brought disease and the Catholic Church to New Mexico, but they also brought some very practical things like horses, pigs, goats, sheep, chickens, cats, cattle, donkeys, and bees. In addition, they shared farming techniques and new seeds and introduced agricultural tools like plows as well as weapons that could be used for hunting. And a recent event in Santa Fe reminded me of one way in which Native Americans have flourished post-invasion. 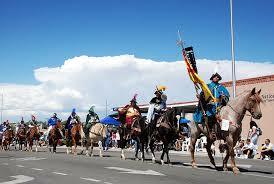 Santa Fe annually hosts the Indian Market, which attracts an estimated 150,000 visitors to the city. More than 1,000 Native American artists from over 200 tribes nationwide displayed their art here in August, and it is truly spectacular–jewelry, weavings, paintings, carvings, basketry, and on and on. At the same time, events like this that have turned Santa Fe into a thriving tourist center have also served to attract the wealthy to this area. This is good for business on the one hand, but the competition for real estate is rapidly driving up the cost of housing to the point that “affordable” homes are difficult to find. The Law of Unintended Consequences is afoot, but there is no way to backtrack and edit change that was inevitable. Coincidentally, both Santa Fe and Jamestown came into being in 1607, the result of Europe’s great ships bringing explorers and settlers to the New World. As I mentioned in the previous post, “When you have something, you have to do what it’s for,” and the invasion of America was inevitable. The result is a history textured by destruction and loss as well as amazing advances. One feels great compassion for the Pueblo Indians and the way their lives were disrupted, but there is an historical context that puts the Spaniards in a better light. 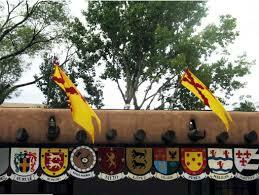 They gave the Pueblo Indians land grants that enabled them to continue to live in their homeland. In the rest of America, however, Native Americans were gathered up and confined to reservations, sometimes hundreds and hundreds of miles away from their homeland. The Spaniards came here in pursuit of silver and gold but also determined to gift the Pueblo Indians with Christianity. They were harsh, but they were also tough, daring, and courageous, qualities we admire. Those qualities have been imaginatively visible and inspiring in the costumed horsemen in the Entrada, and so it will be missed. Complicated, isn’t it? But the Native American activists in the case of the Entrada have demanded that we acknowledge the truth of Don Diego de Vargas’s entry into this city. Hopefully, this will result also in finding an inspiring and ceremonial way to build honorably on the truth rather than a convenient, even profitable, fiction. What can I say….another fascinating article. It never ceases to amaze me just how much you research and know. I love reading about your area, New Mexico and the Southwest. I must admit it pains me to read info like yours regarding the way our Native Americans were treated and in some ways are treated. As you note, we can’t go back & rewrite it, but we sure can be aware and work to make things better for all.